Karina's Kreations: GDP#029 Stampin'Up Honeycomb Happiness! There's only 2 days left for Sale-a-bration. This cute Honeycomb Happiness stamp set #141291 is one of the free sets you can get with a $60.00 order. The color combination is part of a Global design project challenge. The challenge was to use Early Espresso, Bermuda Bay and Tangelo Twist. I used the Honeycomb Embossing Folder #129378, the Banner Punch#133519 and the Honeycomb Embellishments#140556 on my card. I am going to miss this stamp set when it goes tomorrow. I love how you have used teh colour combination this wee. You have really ramped up the cuteness factor of this Chick! Thanks for playing with us at Global Design Project! Thanks Paula! I'll miss this set too! I agree Fiona! He's so cute!!! 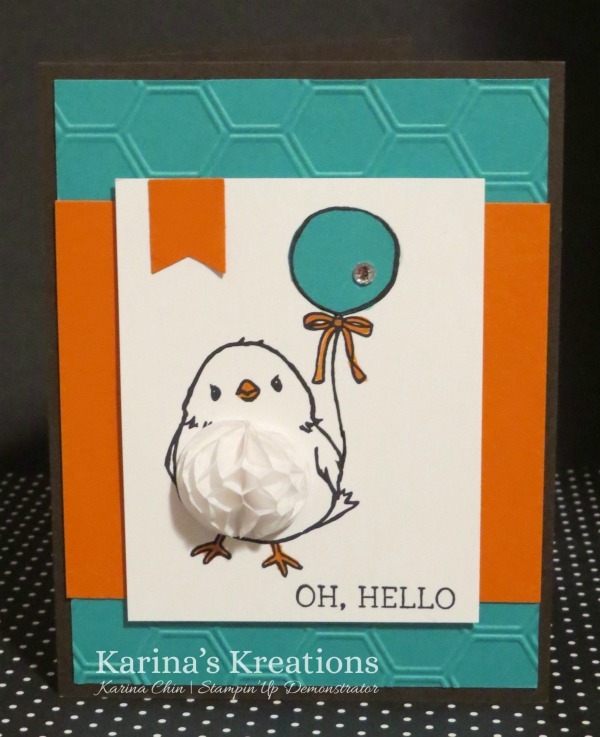 Karina - your sweet chick is adorable! Love the layout of this card. Thank you so much for playing along with this week's GDP Color Challenge! Thanks Brian! It was a fun challenge! It's nice to try different color combos! So cute Karina! I struggled with this color combo and you make it look so easy!!!! Thank-you for playing along with the Global Design Project! Thanks Krista!!! I do love a challenge!